A registration code is required and sent via email to new members. New members of the San Diego Horticultural Society are invited to an orientation meeting. At this casual event new members will meet board members, learn more about the San Diego Horticultural Society, future plans and perhaps make new friends. 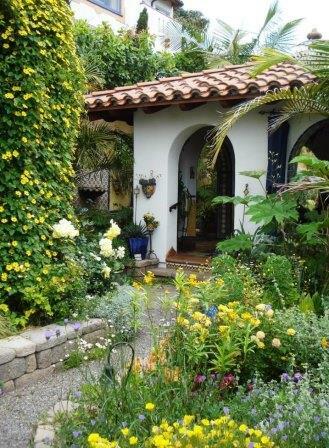 The 1930's Spanish-revival style house and garden is in Mission Hills overlooking Mission Valley. Scott and Jim have been gardening on the steep hillside for 15 years. In 2003, an old, cold, swimming pool was filled in and replaced by a walled garden with a stair tower and outdoor room for entertaining. Paths below the walled garden wind down the hill to an observation point 5 stories below the house. There is a succulent garden in front of the house and many potted plants in the courtyards and on the terraces. The garden features a collection of colorful and low water plants. The Registration code is emailed to new members. Parking is limited - carpooling is recommended. Address and Google Map link are included in the registration confirmation email.